At a time when Russia faces widespread diplomatic fallout from the poisoned spy scandal and Turkey frustrates Western allies amid human rights concerns, these two rival nations are teaming up with Iran, a country that may soon restart its nuclear weapons program. On Tuesday, Russian President Vladimir Putin and Turkish President Recep Tayyip Erdogan put aside previous tensions and attended a ground-breaking ceremony for a Russian-made nuclear power plant under construction on Turkey’s Mediterranean coast. On Wednesday, the two met with Iranian President Hassan Rouhani to discuss Syria’s future at a summit in the Turkish capital of Ankara. According to reports, Russia, Turkey, and Iran are working together to create “de-escalation zones” to end the seven-year civil war in Syria. While this news is significant to the international community, it may also be important from a Biblical perspective. 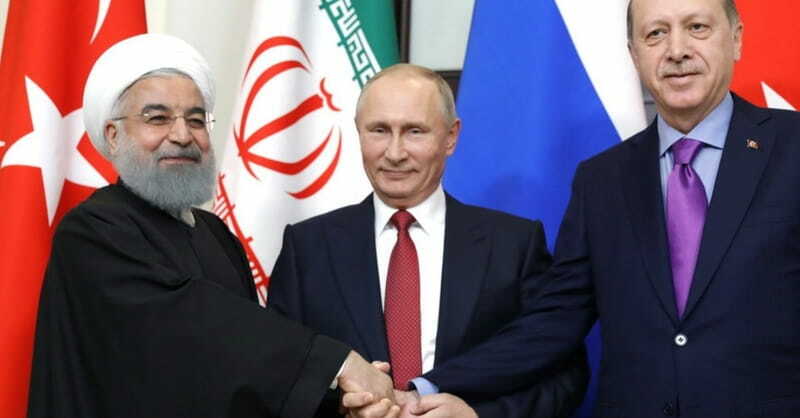 Some scholars say the alliance of Russia, Turkey, and Iran sounds strikingly similar to a coalition foretold by the Old Testament prophet Ezekiel. The prophet Ezekiel ministered to the Jews who were exiled from the Promised Land after Babylon invaded Judah. Toward the latter part of his book, Ezekiel predicts future events that many modern Bible scholars say have not come to pass yet. Relevant to our conversation today is a prediction in Ezekiel 38-39 about a war in which a coalition of nations “devise an evil plan” against Israel (see Ezekiel 38:10 ). God defeats the enemies of Israel. In fact, God’s word says the defeat will be so extensive that it will take seven months for the people of Israel to find and bury the remains of their enemies (Ezekiel 39:12 ). Israel will be secure and unafraid in its land. God will display His holiness among the nations. The Ezekiel 38-39 prophecy contains some obscure names as villains: Gog from the land of Magog, Persia, Ethiopia, Libya, Gomer, and Beth-togarmah. Look back at the bolded names on the list. Russia, Iran, and Turkey are now collaborating. Meanwhile, Libya and Algeria are already closely aligned with Russia and hostile to Israel, and Sudan is a radical Islamic Sunni state allied with Iran and Russia that is anti-Israel. While there is no immediate or specific threat to Israel, the alliance of these nations is noteworthy. Is the alliance of Russia, Turkey, and Iran a precursor to the events prophesied in Ezekiel 38-39? Time will reveal the answer. Meantime, what we do know is that God gives us prophecy to help us understand He has a sovereign plan for the future – a perspective that helps build our confidence in Him today. Laura Lacey Johnson is a cutting-edge faith and culture writer who focuses on everyday headlines. In addition to speaking, she is a columnist for Christian Headlines.com. To read Laura’s latest work on the headlines, visit www.lauralaceyjohnson.com, or to download your FREE copy of Why Jerusalem is Important to 3 World Religions, subscribe to her blog here.